Design Your Days | Living A Lifestyle That You LOVE! Living A Lifestyle That You LOVE! Where do the days go? Yep, it’s been another two weeks plus. Let’s just say that due to unforeseen circumstances I had to take a mini hiatus but BABY I’M BACK! While the days rolled by I contemplated what to write about next, was it a Top 5 list, share an inspirational quote…admit it, we all like a little goodness in our day :-). Then I was thinking I need to put more on Facebook, what kind of impact could I make there and on and on. Well, after all that, tonight I felt led to talk about GRATITUDE. I know, tis’ the season that everyone and their brother are going to be writing posts about thankfulness. However, I thought I’d get a jump on things and add my two cents on the subject early. One of the main reasons I named this blog Design Your Days was because I believe that each day is a gift which should not be wasted but “designed” to be IMPACTFUL. What does that look like? How do I do that? Well, in my experience a heart of gratitude makes all the difference. 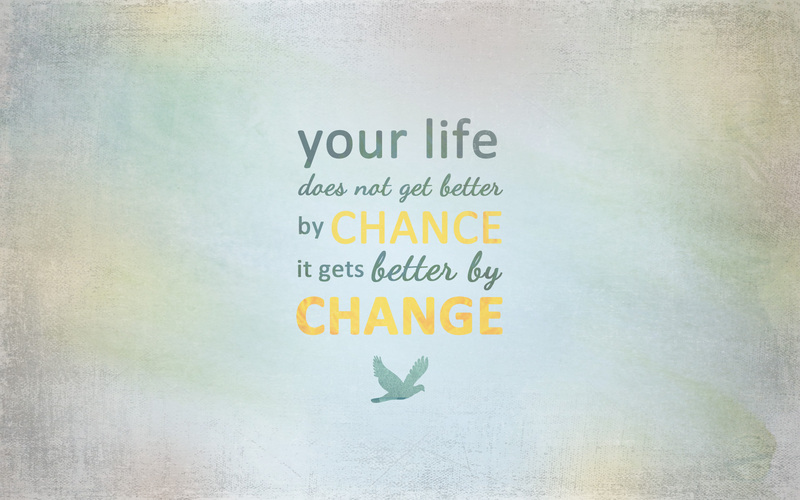 We can’t let our circumstances dictate our attitude. Admittedly easier said than done! Everyday you have a CHOICE. Choose gratitude first! I’ll help you get started…let’s think of ways to HAVE gratitude…you’ve opened your eyes in the morning to another glorious day (meaning you are alive and breathing), you have a roof over your head and heat to stay warm, you have food in your pantry, your kids are healthy and thriving, you have work that you can do, you have a car to drive that also has heat to stay warm, you have family and friends that are willing to be a part of your life and love you despite issues and flaws, you live in a country where you have freedom. There are MANY ways to have “the quality of being thankful”, only one or two of these examples may resonate with you BUT this should get you thinking. After realizing how amazing you have it and what blessings are right under your nose, it’s time to go SHOW some gratitude. Thank God for another day, the opportunity to make a difference in someone’s life, thank the barista for that delicious holiday drink, help a person (family, friend, stranger) in need, open the door or elevator for someone, let that car in even though they aren’t using a turn signal, tell your significant other how thankful you are for them, tell your kids the same no matter how young they are, smile at people, call an old friend or a new friend and remind them how you appreciate them. The “readiness to show appreciation and to return kindness” should become a daily attitude. I challenge you for the rest of the month of November to embrace the attitude of gratitude by having and showing thankfulness. Each day THINK of three reasons to be grateful and then DO three things to show kindness and thankfulness to others. At the end of the day journal down all the goodness and see how your days start becoming more impactful. 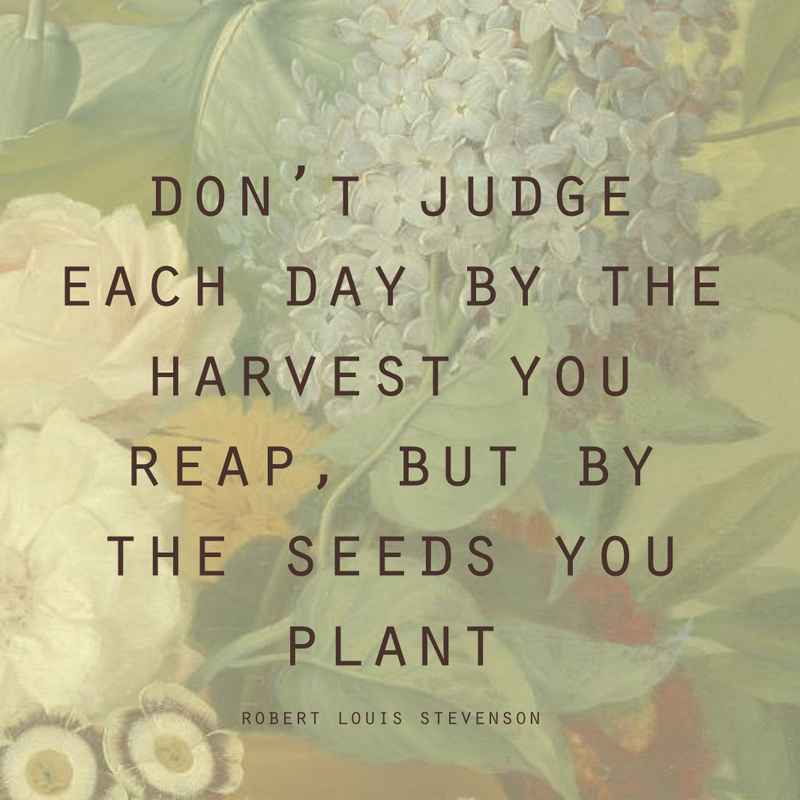 You design your days, so make each one count! How do you have and show gratitude? Are you ready to take my challenge? I’d love to hear your stories and feedback in the comments below. That’s right, after traveling for a week to the beautiful state of Colorado to spend time with my amazing family, celebrate my grandfather’s 92nd birthday and take in the majestic Rockies we have come home and caught the common cold…boo hiss! BUT we will not let that get us down because we are always armed in our house with ways to prevent and treat ailments especially when it comes to cold and flu season. I know it’s easy to go to the drug store and pick up over the counter medicine with the idea that you’ll feel better the next day. 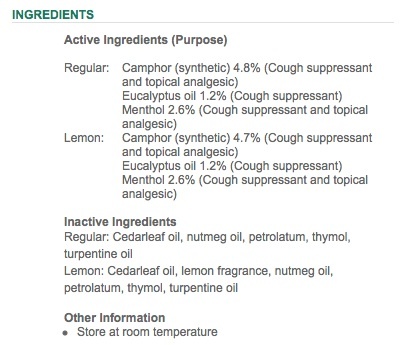 Have you ever looked at the active and inactive ingredients list on the back of that cold and flu medicine bottle? Or those gel caps and nasal sprays? What exactly are you taking to FEEL BETTER? 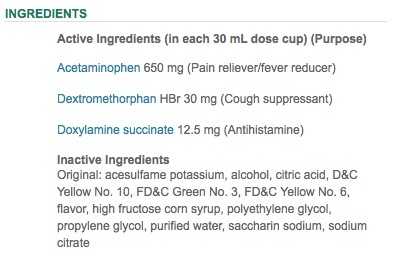 Below are the ingredients to Vicks NyQuil Cold & Flu Liquid – Alcohol, Synthetic Colors & Dyes (Green/Yellow), Polyethylene Glycol, Propylene Glycol…WHAT?!?!?!?! AND that’s not even the ACTIVE ingredients! 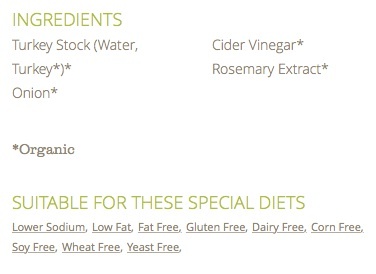 You can read about why these ingredients are bad news HERE. 1. Black Elderberry Syrup – Ditch that bottle of liquid medicine and let’s not only HEAL the body but PREVENT it from getting the cold or flu in the first place. Black elderberries have been used for medicinal purposes for centuries, especially for flu symptoms. There have been studies done to prove its effectiveness. Also known to decrease inflammation. 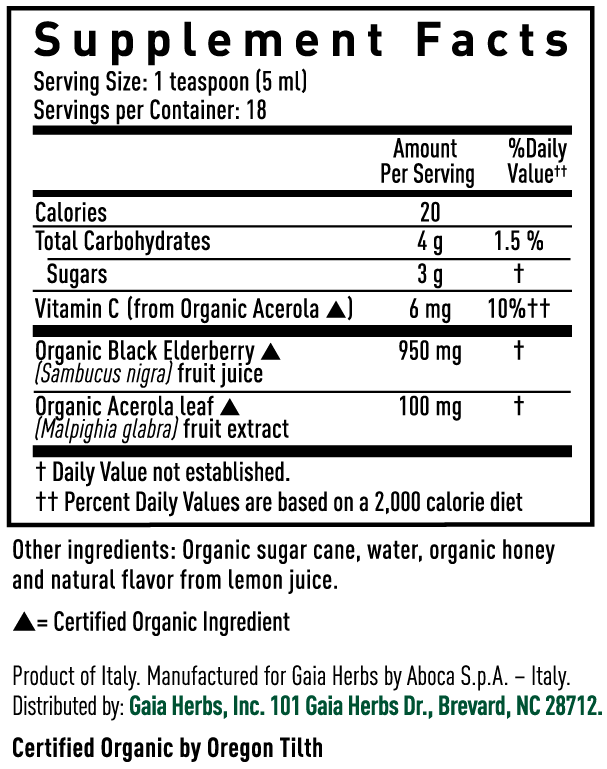 Not only are black elderberries healthy, containing antioxidants and vitamins, they also taste delicious. In our house we take black elderberry syrup daily as soon as the cold and flu season begins, usually beginning in October. It can be taken by adults and children. There are several brands to choose from, we use GaiaKids so that we have exact dosage needed for our toddler. The dosage for adults is listed on the box as well. Additionally, if you search the internet you can MAKE YOUR OWN black elderberry syrup, which can be very cost effective! 2. Bone Broth – Did you think I was going to suggest Campbell’s Chicken Noodle Soup?!?!? 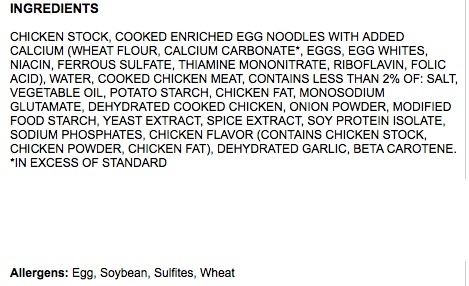 Just to be clear why I wouldn’t, you can check out the ingredient list below…monosodium glutamate, soy protein isolate…PLUS all the allergens! NO thank you, we are trying to heal our bodies, not pollute them!!! Now, back to the DELICIOUS, healing, and nutrient filled bone broth. My crunchy mamas out there would tell you the best bone broth is HOMEMADE! Which I would absolutely agree, since you can choose your type of bones (chicken, turkey, etc…), add vegetables, vinegar, garlic, or spices. One of my favorite recipes by Diane Sanfilippo can be found HERE. I recommend making a double batch and freezing it to use during the entire cold and flu season. In a pinch when you don’t have time to make your own, a good option is Pacific Foods Organic Bone Broth which comes in two different flavors – Chicken or Turkey. 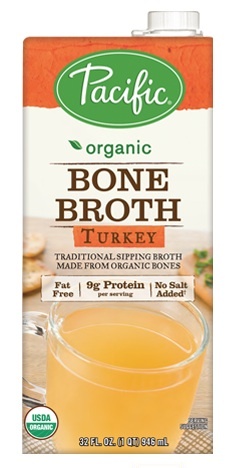 To combat our colds this week I picked up a box of the Organic Turkey Bone Broth at Whole Foods and although not at as tasty as the homemade version it did help with the healing process. This blend dates back to the 15th century. Thieves, who would rob the bodies of the dead, would cover themselves in oils to avoid getting the plaque. In 1997, researchers studied the effects of these oils and found them to be a killing force against microorganisms. 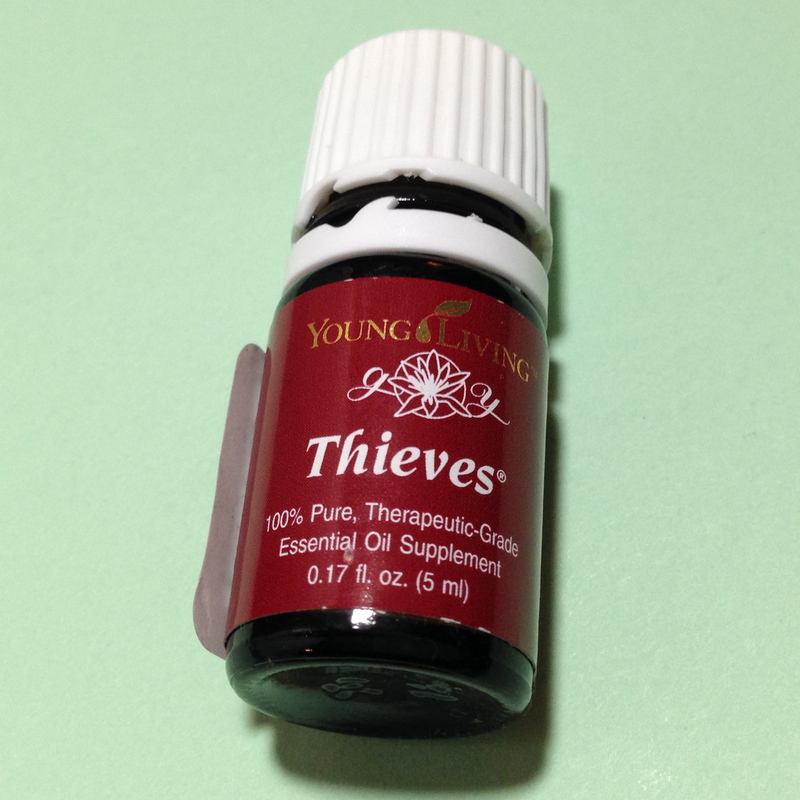 Young Living Thieves Oil is a blend of Clove, Lemon, Cinnamon, Eucalyptus Radiata (safe for children) and Rosemary. It is known for its antiviral and antibacterial properties. For my husband and I, we apply one drop of Thieves oil neat (no carrier oil) to the bottom of our feet. This can be at night before bed or throughout the day for best results. For our toddler, we mix three drops of Thieves oil with one ounce of coconut oil then apply a dab to the bottom of each foot. We keep the remaining to use for future applications. Lastly we diffuse eight drops of Theives oil in about one cup of water in our electronic diffuser. Cleans the air as well as assists in the healing process. If you’d like more information on Young Living and/or how to become a Distributor (discounted oils and shipping) click HERE. 4. 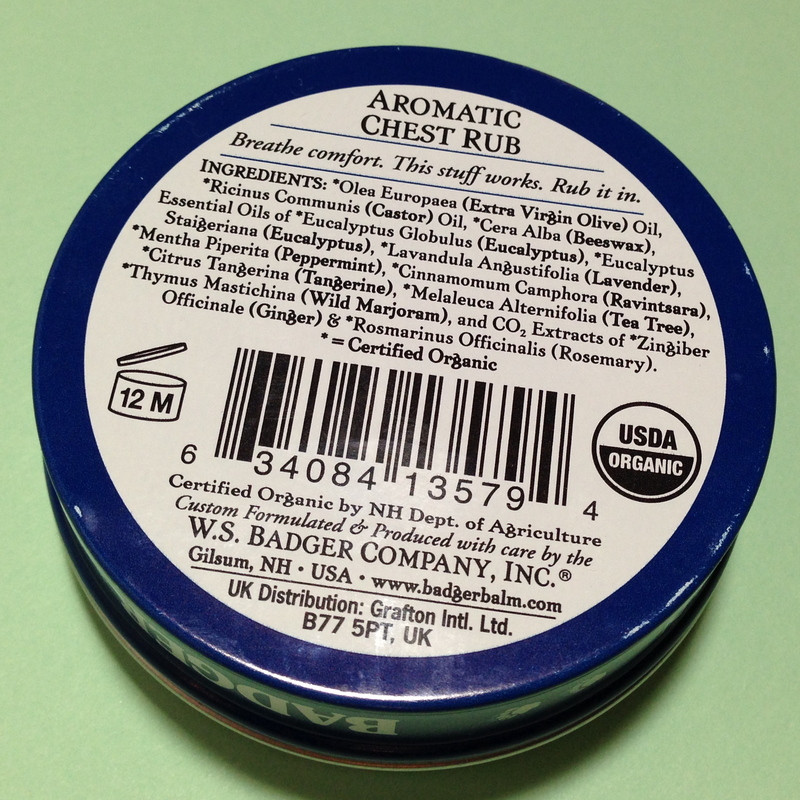 Badger Aromatic Chest Rub – First, let’s go back in time…when we were kids and that cold and flu bug hit the house. Who didn’t get the rub down with the Vicks Vapor Rub? It was the go to for my mom. Obviously as a child I had no concern about the ingredients, I mean it was being sold in stores and everyone was using it. I admit years later I still trusted that brand and kept a jar in my medicine cabinet, clueless to its contents. How many of you have done the same?!?! STOP…please take a look at not only the active ingredients but watch out for the INACTIVE ingredients as listed below…petrolatum, thymol, turpentine oil…again, NO thank you! 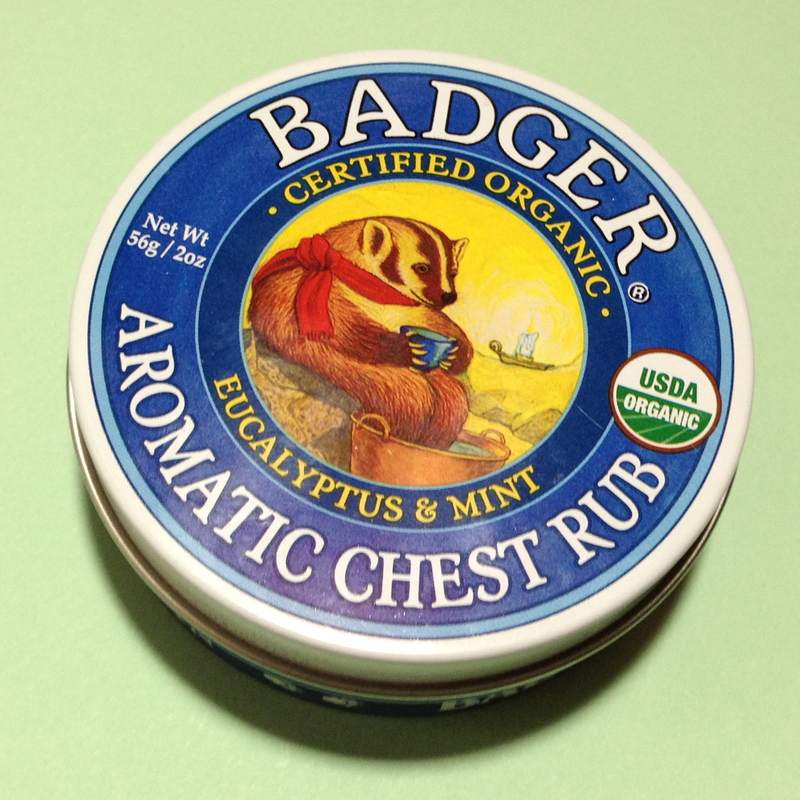 Ok, back to Badger Aromatic Chest Rub…SAFE and EFFECTIVE, I swear!!! Made with organic ingredients as seen in the photo below. Eucalyptus – Helps with any cough and nasal drainage, promotes normal breathing and gives this balm that energizing aroma. Lavender – Antiseptic and antifungal properties, to rid the germs that have invaded the body and allow the healing process to begin. Peppermint – Not only helps with respiratory issues, but also nausea and headaches which can occur when a cold or flu strikes. Helps to reduce inflammation and has antiviral and anti-bacterial properties. Extra Virgin Olive Oil – Keeps skin moisturized and super soft!! 5. 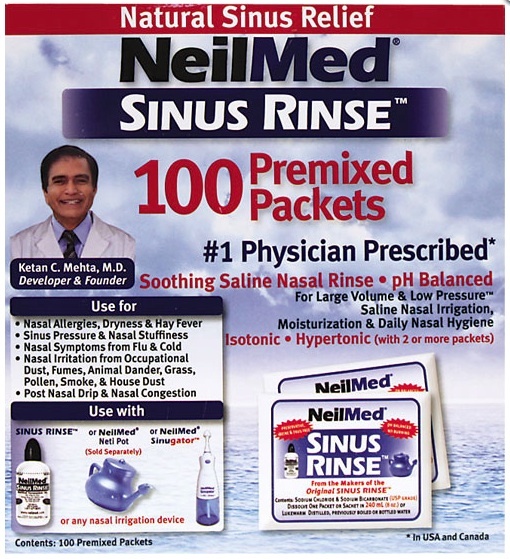 NeilMed Sinus Rinse/Neti-Pot – You have to try it only ONCE to realize how much you love it! I’ll admit years ago when I first got my NeilMed Sinus Rinse I looked at the box and thought you’ve got to be kidding me, I will NEVER use this. It looked complicated and when feeling sick the last thing I needed was to deal with was rinsing my sinuses. Fast forward to present day and this product has worked amazingly!! So, ditch those nasal sprays that are filled with nasty chemicals!! Not only works for colds and flus BUT also ALLERGIES!!! 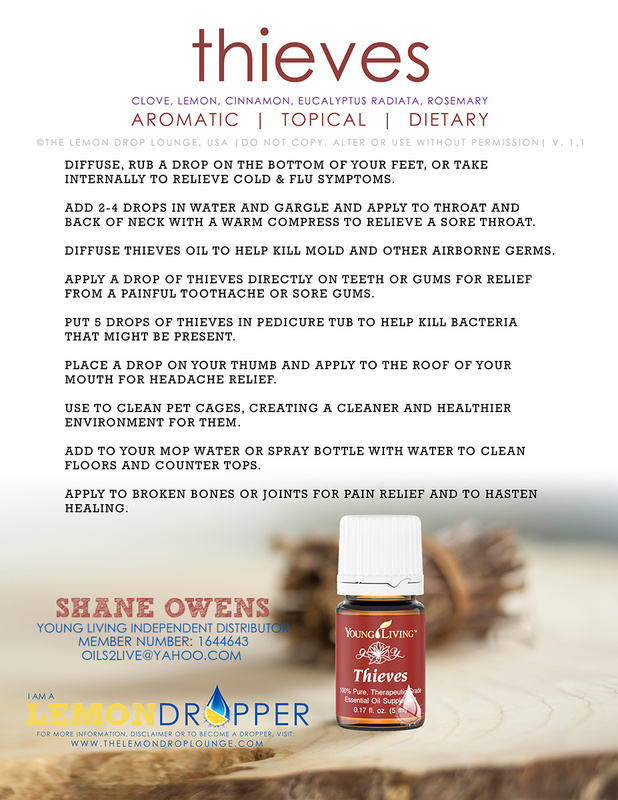 In addition to my essential oil allergy trio (which you can read about HERE) that I apply behind my ears and base of neck, this has also saved me during the spring when the pollen arrives. Now how to use it…Add premixed packets of sodium chloride (salt) and sodium bicarbonate (baking soda) with purified water and deliver streams of the solution through the nasal passages. Sound messy? Yes, a bit. However, the relief that is felt after is worth that little bit of mess. I recommend definitely reading and following the instructions to make the whole process easier! 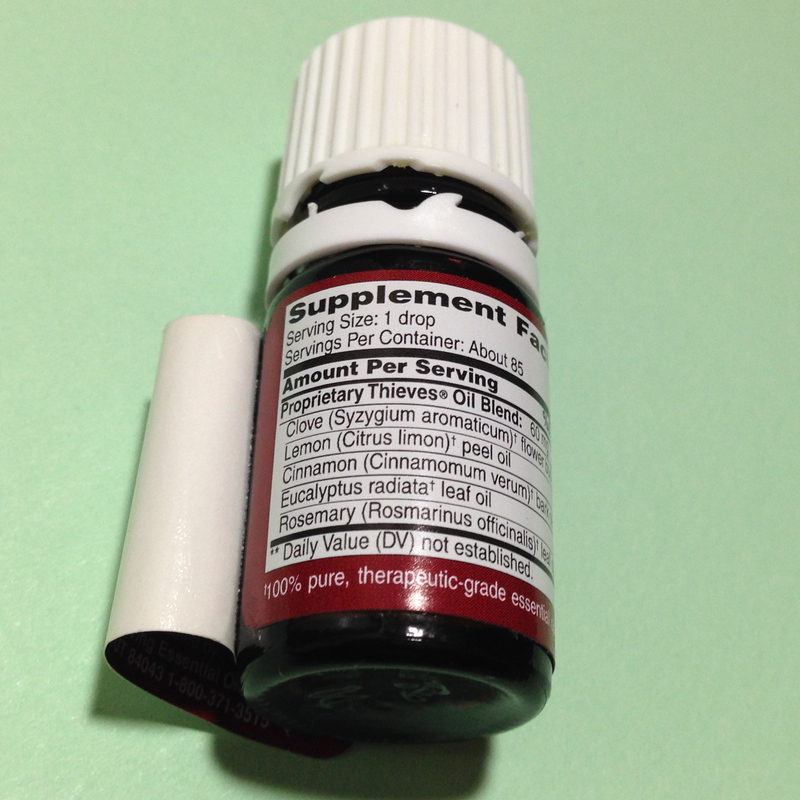 When sickness or allergies strike, using this twice a day can be very effective. You can purchase at large retail stores or drugstores. The toxic burden that we are putting our bodies through on a daily basis and especially when we are sick can be changed. You CAN choose safer and effective products that are HEALTHY for you! 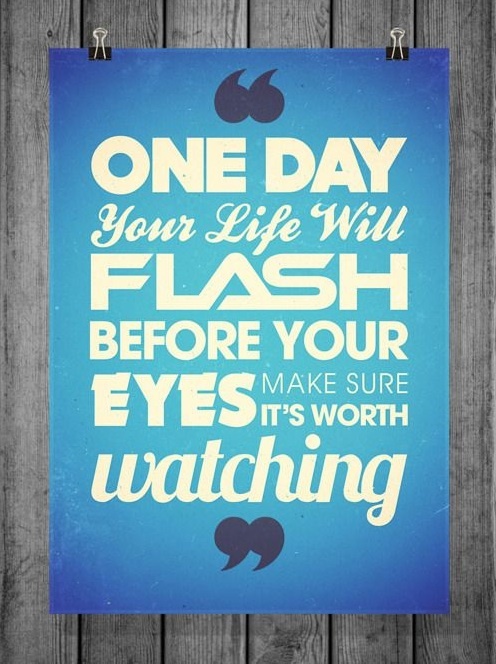 Remember you design your days, so make each one count! Which alternative option are you ready to try? What other natural ways do you beat the common cold and flu? I’d love to hear your stories and feedback in the comments below. Disclaimer: The information shared with you is based on my life experience, facts and research. This information is not intended to diagnose, prevent or cure any illness or disease you may have contracted. As I am not a doctor, I advise you to consult with your physician when it comes to information listed above if you are concerned. Additionally, I will not be held liable for any loss or damages. Thank you! Fall is here!!! Cooler weather, leaves turning colors, pumpkins, sweaters, the list can go on and on. Yet our focus this week is on deodorant?? No matter what the season we all wear deodorant or antiperspirant EVERYDAY! 1. Aluminum – Seriously BAD STUFF! Found as the ACTIVE ingredient in antiperspirants, as seen in the photo below. It is a METAL, that is being applied to skin to block the sweat pores. Yeah, no thank you! It is has been linked to BREAST CANCER and ALZHEIMER’S. Google it. You’ll see websites, studies, actual testimonies from people who have been affected by this known CARCINOGEN & NEUROTOXIN. It is best to avoid this ingredient all together. 2. All The Other Chemicals – Just the fact that it says chemicals plural should be ALARMING! This includes PARABENS, PROPYLENE GLYCOL, FRAGRANCE, PHTHALATES, TRICLOSAN. 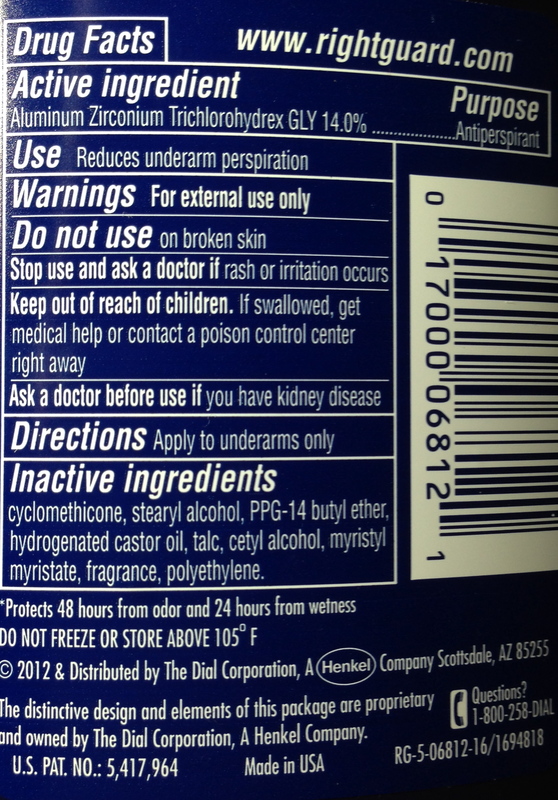 These can be found in the ingredients of not only antiperspirants but also deodorants. Click HERE to read more details about these chemicals. Curious aren’t you? Go ahead, go get your deodorant or antiperspirant. Take a look at what you are putting on your body! 3. Target Market – Ever wonder why there are brands for women and brands for men? Is it really necessary? If I’m not mistaken, it’s all used for the same purpose. The companies that produce these major brands realize that we are a visual society, that color and shape are what appeals to us as consumers more so than the actual ingredients used to make the product. Don’t be FOOLED! THE INGREDIENTS ARE WHAT MATTER THE MOST! 4. We LOVE Sweat – Did you know you have over two million sweat glands? Amazing, right? Just think about all the TOXINS that are being FLUSHED OUT of your system when you sweat. It’s internal cleaning. 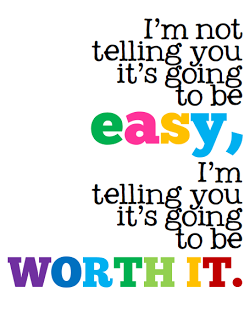 Think about that last workout or run and how great it felt when you were done. Is it unsightly? Yes. Is it messy? Yes. BUT SWEATING IS REFRESHING!!! Now, the key to underarm sweat is to keep the odor at bay. Sweat itself has no odor, it is the skin bacteria that mixes with the sweat that causes the body odor. There are SEVERAL natural ingredients that can STOP that body odor, such as aluminum free baking soda, arrowroot and tea tree oil. So, go ahead, keep sweating away, we’ve got you covered! 5. Ava Anderson Non-Toxic Deodorant – IT REALLY WORKS! It is been a staple in our home and one of the most sought after Ava products. This product is highly hand crafted – hand cut, measured, prepared, poured and capped in Rhode Island where this amazing company it based! The SHORT list of SAFE & EFFECTIVE ingredients make this the BEST CHOICE! The toxic burden that we are putting our bodies through on a daily basis can be changed. You CAN choose safer and effective products that are HEALTHY for you! 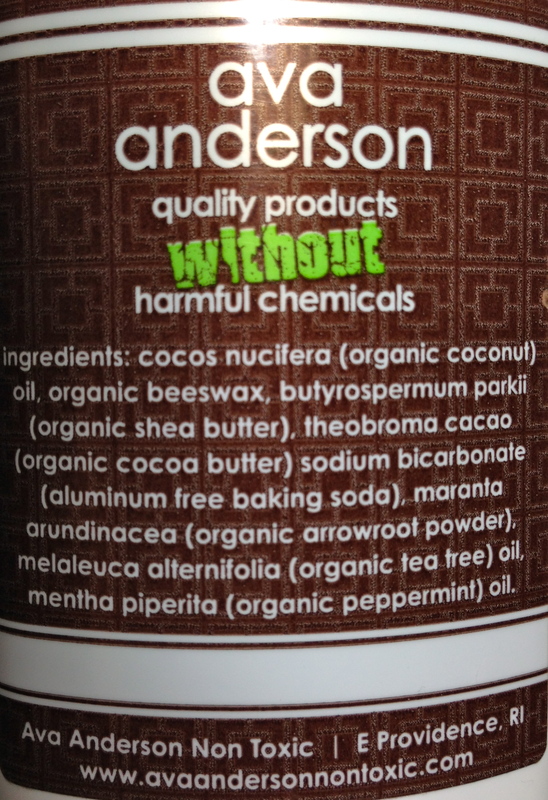 This is why I LOVE my Ava Anderson Non-Toxic products, FREE from harmful chemicals! If you are interested in learning more about Ava Anderson Non-Toxic and/or are ready to try these safe, organic, effective products for yourself, your family, pet or home please click HERE! What ingredients did you find in your deodorant or antiperspirant? I’d love to hear your stories and feedback in the comments below. Well, the time is finally here!!! I have some very exciting news to share this week! First, I want to say that it has been such a blessing to write this blog. Each week I get the opportunity to share about topics that I am so passionate about. EVEN BETTER, I have amazing readers like you that like, comment and follow my blog posts. Thank you, thank you, thank you!! I just want to give you all BIG HUGS!!! On that note…it’s time to expand…social media, here we come!